Marching on Ogoni Day, January 24, for a stop to drilling and pipelines in Ogoni lands. MOSOP President Legborsi Saro Pyagbara. My fellow Ogoni people, we are here today not as winners in any lottery game but we are here in celebration of our freedom and the liberty that we won on January 4th, 1993 when our forbears led by our late mentor and leader, Ken Saro-Wiwa took that giant leap and over three hundred thousand Ogoni people marched for national rebirth, national rediscovery and a journey for dignity and pride. They marched so that we may live. They marched that we may lay claim to a life of honour and dignity. They marched on January 4th to lift us from the valley of oppression as minority and indigenous peoples, to the brighter hills of Ogoni redemption. On January 4th, we made ourselves anew, and vowed to move forward together. A new Ogoni was born. My dear brothers and sisters, whilst some of us here partook in that march, let us not forget, that today, we are all the heirs of that first revolution. We must realize that the torch had been passed on to us to continue the struggle for our human rights: our right to life, our right to health, our right to a safe, clean, healthy and sustainable environment, our right of self-determination and our freedom from poverty, to which our forbears has always been committed, and to which we are committed today as a people and as citizens of Ogoni nation both home and abroad. Whilst appreciating the fact that our rights comes not from the generosity of men but from God, we know that freedom and rights must be secured by us to make any meaning. The knowledge of the sacrifices of our forbears will keep us forever vigilant against those who would want to do us evil by trampling upon our God-given rights. Each time we gather to commemorate 4th January, we renew our commitment to continue to protect and jealously guard the freedom and rights that it pleased the Almighty God to give to us. Each time we gather on 4th January, we bear witness to the enduring strength and resilience of our people. We recall that what bind us as a people in this generation is not clannish emblems that we bear, but rather our abiding fidelity to the ideas of our ancestors and our total allegiance to our declaration, the Ogoni Bill of Right. What makes us exceptional is that our struggle like every struggle founded and prosecuted on the twin pillars of truth and non-violence must continue to be the enduring alternative to the condemned face of violence. Today, my co-travellers, we continue on that uncommon journey to link our understanding of those words with the current environmental, social, cultural and political realities of our time. It is in furtherance of that journey that we on June 29, 2013, launched the Ogoni Project 2015. In Ogoni Project 2015, we have taken a dispassionate assessment of all aspects of Ogoni life since 1990 when we launched the Ogoni Bill of Rights. We have designed activities and actions about what needed to be done between now and 2015 marking the 25th anniversary of the Ogoni struggle particularly in addressing issues of political autonomy, environmental degradation, political marginalization, cultural annihilation and economic exclusion. This project has been launched in order to safeguard our dignity and promote our unique identity, our language, our culture, our education, our health and our environment. Let me use this opportunity to announce to you that MOSOP has concluded plans to host a World Conference on Ogoni People in 2015. The details of this conference shall be announced to you later. Through this conference, MOSOP hope to shape a new post 2015 development agenda for the Ogoni people. Our ancestors taught us that water is life; they taught us that our forests with its collection of trees are the cathedrals of life; they taught us that we and our animals have a psychic relationship that we are caught up with in the same web of life. Today, Ogoni is undergoing profound environmental changes. Following over three decades of ceaseless and reckless oil production, the Ogoni environment had been totally devastated. Despite all Shell’s claims to the contrary, it took the courage of the then UN Special Rapporteur to Nigeria, Mr. Soli Sorabjee, to recommend an environmental audit of Ogoniland. Following that recommendation, the Nigerian government took eight solid years before inviting the United Nations Environment Programme (UNEP) to carry out the environmental study of Ogoniland. As you are aware, UNEP submitted its report to the government and peoples of Nigeria on the 4th August 2011 with far reaching observations on the state of the Ogoni environment and made several recommendations. Following the failure of the government to implement the recommendations of the study and after several failed efforts, under Ogoni Project 2015, the Ogoni people gave the government a 90-day ultimatum to set in motion a clear and transparent process of clean-up and restoration of Ogoni environment. The government had failed the Ogoni people. This was the reason the Ogoni people commenced their series of non-violent actions on the 10th December 2013 in a carnival of the oppressed. Whilst we commend the Ogoni people for their peaceful conduct during the march, we are appealing to the government to act responsibly by starting immediately to address the issues raised by our protest march on the 10th December 2013 amongst which include the disbandment of the Hydrocarbon Pollution and Restoration Project (HYPREP) and the setting up of a truly independent and statutorily backed intervention agency to handle the clean up and restoration of Ogoniland. The ongoing delay on the part of the government to implement the UNEP report will continue to be seen as an act of genocide being committed against the Ogoni people. Our series of non-violent actions will continue in the face of government’s failure to implement the recommendations of UNEP. We state unequivocally that time is running out on the Jonathan Administration to address this issue. I repeat, time is running out. It is time to match political will with actions on the ground just as the President has done with the amnesty programme. Today, that programme has gulped over three hundred billion naira (N300, 000,000,000) for only thirty-thousand people (30,000) yet the same government has failed to facilitate the release of just one billion dollars (about One hundred and sixty billion naira) to begin the process for the cleanup and restoration of Ogoniland that involves close to a million Ogoni people. I also wish to address information that had reached us concerning the plan by Shell to put its Ogoni oil concessions on sale. It must be underscored that the principle of free, prior and informed consent, which has been recognized by international human rights law, including in the United Nations Declaration on the Rights of Indigenous Peoples, precludes Shell or any other third parties from selling or purchasing Ogoniland without our consent. Ogoni people will not accept it and we would resist it with the last drop of our blood. Ogoniland is not for sale. Tied to the issue of the environment is the health crisis in Ogoniland particularly due to the environmental crisis in the area. The biggest social event in Ogoni these days are burial programmes. Ogoni people are dying on a daily basis; that is already a cause for concern. Whilst we appreciate the efforts of the Rivers State Government in the provision of some primary health care facilities, we are alarmed by the complete collapse of secondary health services in Ogoni. All general hospitals in Ogoni are presently in coma. And despite advances in health care in other parts of the country, there is not a single specialist or tertiary health facility in Ogoni. We are calling on government at all levels to reverse this trend as soon as possible. The political under-representation of the Ogoni people at the Federal and State levels is deeply problematic. The situation where the Ogoni people continue to suffer unmitigated exclusion can no longer be tolerated. Under Project 2015, MOSOP is currently involved in a campaign in which we are requesting the political elites in this country to provide the needed platforms for Ogoni people to contest for the Governorship of Rivers State in 2015. 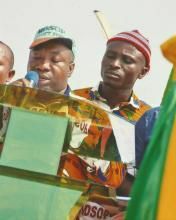 MOSOP is embarking on this campaign conscious of the fact that as at 1998, two main issues had confronted the Nigerian-state, the cancellation of June 12 elections and the Ogoni issue. On return to democracy in 1999 , the political elites of the Nigerian-state agreed with consensus to provide the platforms of their political parties to only Yoruba candidates to assuage their feelings over the cancellation of June 12 elections believed to have been won by a Yoruba. Nothing had been done to the Ogoni people. What we are saying now is that it is time to remember the Ogoni People. We want to sound this as a note of warning to all Ogoni politicians that Ogoni would not be ready to settle for second fiddle come 2015 and any Ogoniman that settles for anything less than the governorship of Rivers State will not be taken seriously by the Ogoni people. It is either we are there in 2015 or we are not there. Our forbears did not fight to replace our hard won freedom and liberty with the acquiescence of the political class with privileges for a few. The quest for Ogoni self-determination continues. As stated in the Ogoni Bill of Rights, MOSOP remains committed to the demand for Ogoni people to be granted political autonomy within the Federal Republic of Nigeria. As we are speaking here today, a two-man team from MOSOP is currently in Nicaragua understudying the autonomous arrangements that had been put in place in that clime for some Indigenous communities. We also note that some other peoples in Nigeria are already enjoying this political autonomy with the “State arrangement” which is empowering them to deal with issues affecting all aspects of their lives. Under Ogoni Project 2015, MOSOP is joining forces with others to call on the Federal Government of Nigeria to initiate the process of the creation of a Bori State without preconditions. It is time to reassure the Ogoni people that they are still part of the Nigeria project. I want to seize this opportunity to inform the young people present here today that as 2015 draws closer, we are calling on the youths of Ogoniland to be ready to set aside personal interest and place our interest as a people on the front burner of every action and decisions that they take in the coming period. There is no doubt in my mind that the youths continue to be the greatest heirs of the Ogoni struggle and its benefits. This means that the youths of Ogoni have a critical responsibility. When confronted by the frustrations of the past, and faced by the temptations of the present, when disillusioned by the seeming hopelessness of tomorrow, all our youth need to do is to think of the sacrifices of our heroes and the many that had laid down their lives for their future and take the course that would assure them that their sacrifices are not in vain. The heroes of any struggle for justice can only be said to have been properly honoured when we win the battle they have begun. The lessons from struggles for freedom globally, is that as you show signs of victory in your cause, this is when opponents and wicked authorities will intensify their efforts to divide people of common fundamental belief against one another. So today, if we truly believe in the Ogoni Bill of Rights, let us not allow ourselves to be used by any politician against ourselves as we march towards 2015. Let us not allow anybody to use us to inflict violence on one another in the name of any party; let us not allow ourselves to be deluded and seduced into taking the life of any Ogoni person in the name of politics. The life of every Ogoniman is valuable to us and never again shall we allow any Ogoni blood to be spilled on the altar of political self-interest. Our message today to every Ogoni youth here is that you must make a new vow to stand with us as we fight against exploitation whether it is by Shell, government, politicians or common criminals. To our neighbours , friends and sympathisers, we thank you all for your support and assure you that MOSOP on behalf of the Ogoni people will continue to reach out and build strong alliances with you in order to take our crusade for justice to every corner of the world, to every valley of oppression and to every prison of hopelessness. MOSOP and Ogoniland must remain a source of hope to the deprived, the dispossessed and other victims of marginalization. It is our sacred duty to do so because of our belief in accommodation, human dignity and justice. Finally, my fellow citizens, let us therefore hold fast to that message of hope and renew our commitment to the cause of justice and human dignity committed to our hands by our forebears when they marched on January 4th 1993. My dear brothers and sisters, it is not only in my hands and those of my executives, but more importantly , it is in your hands, that lie the final acts of loyalty, devotion and of courage to ensure the final success or otherwise of our cause for justice. Let us therefore resolve from this Ogoni Day to unite in ways that we have never before. Let us decide from this Ogoni Day never to play politics with the issues of Ogoni people but to subsume our individual interest under the collective interest of Ogoni people. Let us resolve to set aside competitions that threaten to tear us apart and make a mockery of the work of redemption of our forbears. Let us join hands together to explore what challenges unite us more instead of spending our time on those issues that divide us. It is only in doing so that we will together set Ogoni on a path of greater glory. With the help of God and with the support of the Spirit of Ogoni, we shall win. Long live Ogoni People, Long live Ogoni Nation.